Volkswagen Repair in Boulder by Master Mechanics. Call (303) 449-8949. Offering FREE Initial Repair Assessments. Exceptional performance. Stylish functionality. Unbeatable safety. Your Volkswagen, “the people’s car,” is a reliable and award-winning vehicle with these best-selling models in the US: the Passat; the Beetle; and the Golf. Since its 1946 creation in Germany, safety has been the hallmark of Volkswagen, making it ideal for navigating the rough and mountainous terrain and changing weather conditions in Boulder, Colorado. Blind-spot detection, active and passive safety devices (i.e. anti-lock brakes and anti-slip regulation, electronic stability control) and forward-collision warning are just some recognized VW safety features. In fact, the 2017 NHTSA (National Highway Traffic Safety Administration) has given the VW Golf four-door the coveted 5 star safety rating. Synonymous with luxury and style, Volkswagen’s detailing, responsive handling, comfort and powerful turbo-charged engine have made it a perfect fit for Boulder’s active lifestyle. But even Volkswagen’s need some Tender Loving Care. And when the time comes for some VW TLC, we’re here for you. • Our staff includes highly-skilled VW Master Mechanics. • More than 225 years of combined vehicle and auto repair experience. • State-of-the-art diagnostic tools to ensure optimal results. • We commit to quality repairs by putting our words & actions into gear. VW repairs can be costly. We help you cut costs by prioritizing repairs that need immediate attention versus ones that can wait, by sourcing the best parts for the money and by providing the best mechanics to work on your car. That’s what makes our prices VERY competitive. We recommend an oil change every 5K. A small price to pay to protect your Volkswagen’s engine. Why does my radio say safe after the battery is disconnected? The radio’s theft deterrence is activated when power is lost. A code will have to be entered to restore function. This code is provided with the owner’s manual when the vehicle is purchased. Why do I need to replace my brake rotors when I need brakes? On German cars the brake rotors and pads wear together and are designed to be replaced at the same time for maximum braking performance. Why are my brakes noisy on cold mornings? The brakes can be noisy after sitting over night from condensation. The noise should stop once the car has been driven for a short distance. If the noise persists there may be an issue with the brakes that should be checked out asap. VW’s can potentially have one or many different trouble codes stored when the CEL comes on. That’s why we offer an initial free repair assessment by checking the stored codes and for any obvious under hood problems. If further diagnoses are required we have experienced mechanics and the best diagnostic equipment to ensure we address the problem the first time around. How do I change the key fob battery in my Volkswagen? Read our blog for everything you ever wanted to know about repairing and changing the key fob battery in your Volkswagen. 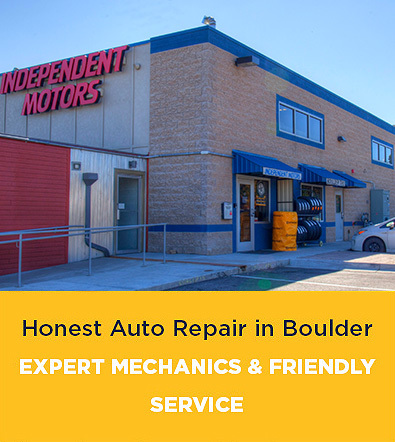 For the best in Volkswagen Repair in Boulder, CO call Independent Motors at (303) 449.8949. You’ll be glad you did!